Come buy some holiday presents for your nearest and dearest! Books will be on sale from $5 and up with a variety of great stories available, along with cultural books and language themed books at our Centers in Mt. 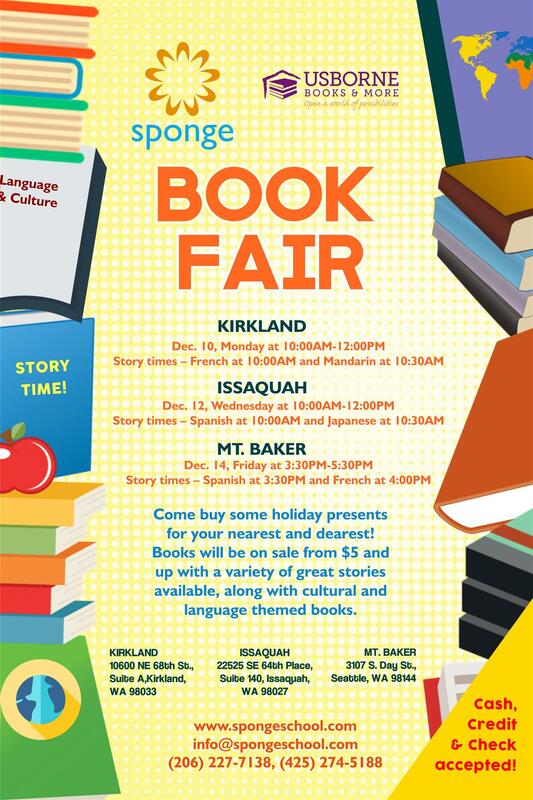 Baker, Kirkland and Issaquah. A story time will also be held where we will be reading beautiful folklores in language. Every child will be given a bookmark to take home to use in their favorite books. We’ll also be giving away a limited quantity of Sponge language books to the first three children to arrive. So come spend some time with us! Buy stocking stuffers, presents to put under the tree for those you love as reading is one of the greatest presents you can give. With story time, you’ll also be able to immerse yourself for an hour in two different languages that you would like your child to learn or that you’ve always wanted to learn. We’re looking forward to reading for you.